HOW to tell if your cow is PREGNANT? Count 21 days from date of breeding, look for signs of heat within a few days of the 21 day mark. If you see no signs of heat, proceed to next steps. If the cow comes back into heat on an odd date, her body may have tried to hold a pregnancy that was not quite ready to stick. If she comes back in heat more than 21 days up to around 42 days, this may be the case. Consider why she may not have bred (see suggestions above). Try to correct any possible issues and continue breeding when the cow has a good, strong heat. Recurring problems may require a vet call to determine if the cow is cystic or unhealthy in her reproductive system. Late-term miscarriages – the cow should be tested for Neospora. How accurate is it? 99% – We have never had a false positive or negative. 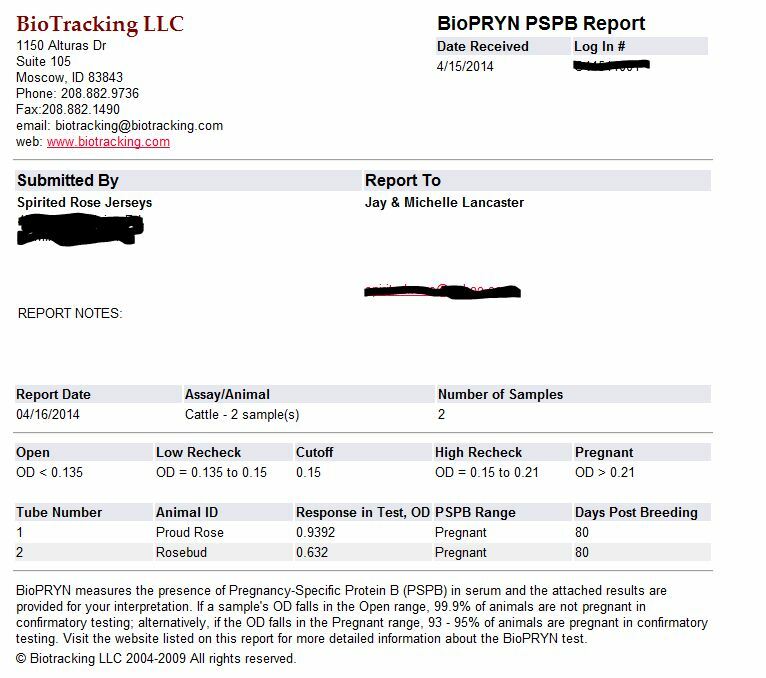 Biotracking does not indicate whether the fetus will be male or female, but in this case both cows ended up having heifers – yay! How accurate is it? 80-85%+ accurate, false positives possible depending on timing.